There are so many VPNs to choose from these days, it can be hard to sift through all the marketing, hype, and reviews to find the best VPN service for you and your needs. That’s why we’ve set out to run some of the top VPNs through the gauntlet and see how they hold up. ExpressVPN seems to have a constant presence on VPN recommendation lists by virtually every major tech blogger and comparison site . Let’s see if it’s the real deal. There’s a lot to like about ExpressVPN. It’s fast, it’s sleek, and it offers a whole lot of servers. Security is top notch, including a strong no-logging policy, military-grade encryption, built-in kill switches, and split tunneling functionality. ExpressVPN’s apps, whether on Windows, Mac OS, Android, or iOS, are easy to use and don’t stress your hardware. And they even offer 24/7 support. Though there isn’t too much to complain about with ExpressVPN, some users will balk at the price. With basic subscriptions starting at $12.95 per month, ExpressVPN is one of the more expensive VPN services on the market. By taking advantage of their long-term subscriptions combined with other discounts, you can coax that price down to $6.67 per month for 15 months – but even that’s a little pricey compared to competitors like NordVPN and Private Internet Access. But as the old saying goes, “you get what you pay for”. As we’ll highlight below, ExpressVPN offers some of the best features, fastest speeds, and most intuitive apps of any VPN in the business. With their premium service in mind, their premium pricing is a lot more understandable. They also offer one of the industry’s best money-back guarantees. 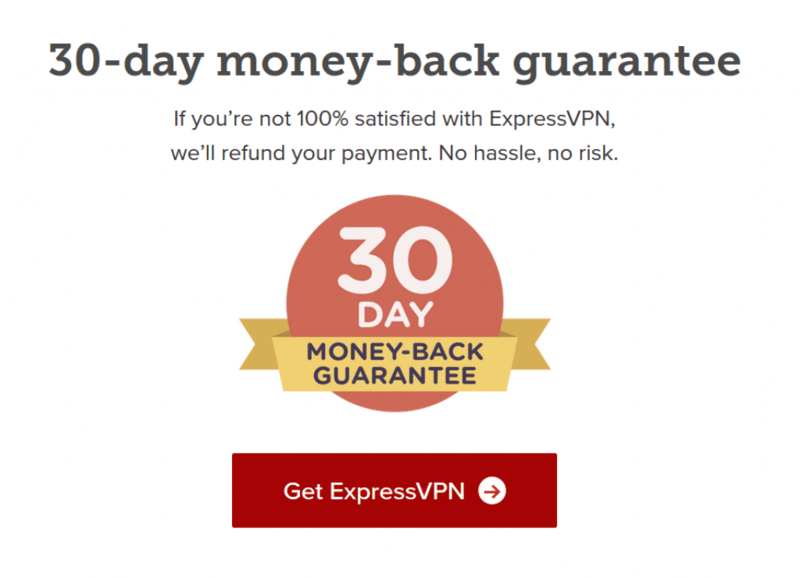 Try ExpressVPN for up to 30 days, and if you don’t like it, you can get your money back – no question’s asked. This applies to both short- and long-term subscriptions. Plus, you can pay for your service with Bitcoin, which is a great option for the privacy-minded. Rather than force you to slog through our long-winded explanations and breakdowns of ExpressVPN’s features, we put together a quick little rundown of what they have to offer. One of the first things most ExpressVPN reviews and recommendations mention is the speed. And for good reason: ExpressVPN is one of the fastest VPNs in the game. In our testing, when connected to the nearest ExpressVPN server we didn’t notice any drop in ping and we were still getting at least 70% of our normal internet speeds. That’s about as good as you’re gonna get. ExpressVPN’s desktop apps for Windows and Mac OS also offers a cool built-in speed test, which will not only test the server you’re currently connected to, it’ll test the ping and download speed of all of the servers – or just the ones in your region, if you prefer. Netflix is determined to prevent users from accessing their streaming service through a VPN. Why? Because a VPN allows you to change your location. And by changing your location, you can watch the Netflix catalog from other countries or even use Netflix in countries where it’s not available. For example, a VPN user can flip between Netflix US, Netflix Canada, and Netflix UK with the click of a mouse. This is good for you but bad for Netflix, since it creates copyright issues and cuts into their profits. And it’s bad for your ISP, since they can’t monitor your bandwidth usage – and streaming uses a lot of data. In short, while it was once very easy to use Netflix with a VPN, even a free one, most VPNs are now blocked. That’s why we’re happy to inform you that ExpressVPN currently has no problem with Netflix. Whether you want to use a VPN server in your home country to bypass ISP throttling or use a server in another country to access a different Netflix catalog, you can do it with ExpressVPN. Now, that doesn’t mean that Netflix will work with every single server, but you should have no problem finding a working server for most major countries. From what we’ve seen, ExpressVPN also works with most other major streaming services, whether it’s BBC iPlayer, Hulu, or Amazon Prime. A reliable VPN is simply a must-have when torrenting. Not only does it keep your download (and seeding) activity safe from prying eyes, it can even allow you to bypass bandwidth throttles by your ISP. It also helps to have a VPN that’s based in a country that’s less susceptible to copyright issues than the United States and the European Union. Fortunately, ExpressVPN checks all of those boxes. You know they’re torrenting friendly, since they even offer advice on how to use uTorrent with their service, and we’ve already covered their logging policy, speeds, and leak protection elsewhere in the review. That they operate out of the British Virgin Islands is another plus for p2p users looking to avoid scrutiny. ExpressVPN is compatible with all of the major operating systems: Windows, Mac OS, and Linux. We really liked what we saw with our Windows testing. Download speeds were very fast, though of course that will depend on which server you’re using, your internet speeds, your hardware, etc. 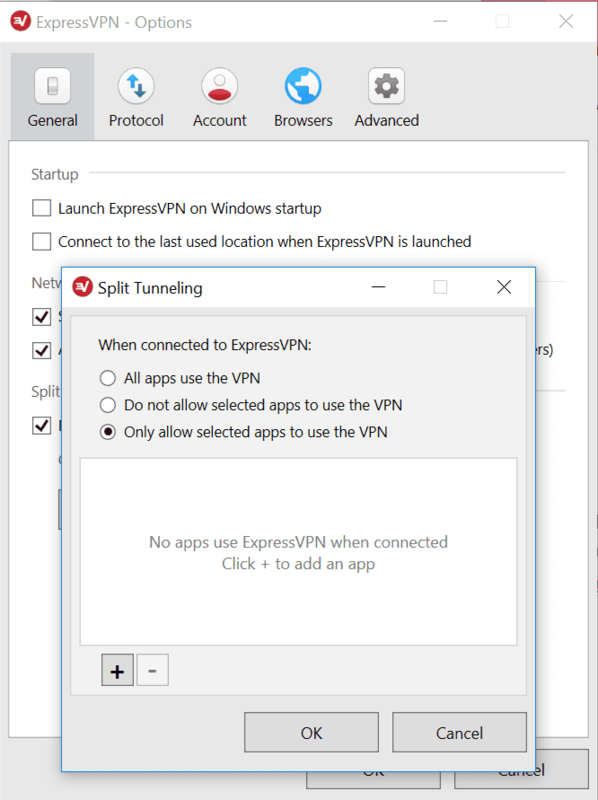 The ExpressVPN app is super easy to use on Windows and requires minimal resources. While there are plenty of advanced settings to play with, the basic process of choosing and connecting to a VPN server is very simply and intuitive. 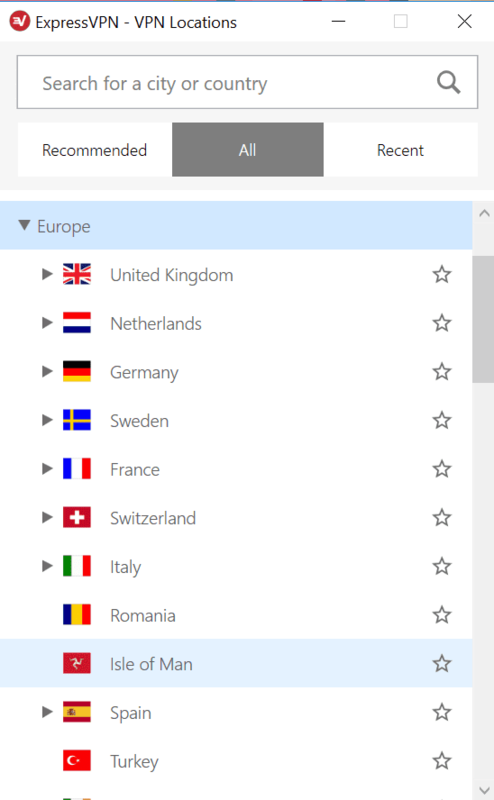 Simply click ‘Choose Location’, select a server from the lists of Recommended, All, or Recent servers, and wait a few seconds for it to connect. If that’s not easy enough, you can also take advantage of ExpressVPN’s ‘Smart Location’ feature, which will connect you to the best location for you. Though in our experience, this wasn’t always the closest nor the fastest server for our area. Disconnecting or reconnecting once you’ve selected a server is as simple as hitting the big power button that’s smack dab in the middle of the app’s main screen. You can’t miss it. ExpressVPN adds even further convenience to their Windows experience via browser extensions for both Firefox and Chrome. These work like a slightly paired down version of the main app, letting you choose a server, connect, or disconnect without leaving your browser window. Though you’ll have to use the main app if you want to mess with the advanced settings, like choosing your protocol or enabling split tunneling, the extensions do have a built-in HTTPS Everywhere setting which will further enhance your online privacy. Security was pretty similar for both Windows and Mac OS, so we’ll cover that in more detail in the security section below. If you’re a Mac user, don’t worry. Our ExpressVPN testing on Mac OS went just as swimmingly as it did on Windows. Speeds were great. As we pointed out above, speeds will obviously vary depending on your settings and setup, but we were quite satisfied with what we experienced. The ExpressVPN app for Mac is just as sleek and intuitive. Simply ‘Choose Location’ from the list of All or Recommended servers, and you’ll be connected in a flash. There’s also a ‘Smart Location’ feature which will choose a server for you based on your location. Once you’ve found a server that works for you, you can disconnect and reconnect simply by clicking the Power button that’s prominently displayed in the app. In our testing, the app was always super responsive and used very little system resources. To add to the Firefox and Chrome extensions we detailed above, ExpressVPN provides a Safari extension for all the Mac users out there. And it’s just as convenient to use, allowing you to choose and connect to a server from within your browser window. It’s still got the handy HTTPS Everywhere feature too. You’ll find more on the security for both the Mac and Windows version in the Security section below. With 2,000+ servers in 148 locations and 94 countries, ExpressVPN has one of the best server spreads on the market. For comparison, ExpressVPN only has about half the total number of servers of NordVPN, but they offer 50% more countries to choose from. This is a major positive no matter where you live, but it’s especially helpful for people who either travel a lot or live in countries that aren’t served by other VPNs. For instance, you’re not going to find a lot of VPN services with physical servers in Uzbekistan or Kyrgyzstan. However, one thing that users should be aware of is ExpressVPN’s use of virtual servers. With a virtual server, you’ll be given an IP address from the country selected, but your internet traffic will actually be routed through servers that are physically located in another country. For instance, if you connect to ExpressVPN’s servers for Cambodia, Laos, Macau, Pakistan, Philppinnes, Vietnam, or several other Asian countries, you’re actually using a server in Singapore. But you’ll have an IP address from the country selected. On the plus side, this allows ExpressVPN to offer IP addresses for countries where it’s either difficult or expensive to offer physical servers. This means users can access local versions of websites and better obscure their VPN use. On the other hand, you’ll also suffer from lower ping and bandwidth because of the distance between you and the physical server. This may not be a big deal if you’re surfing the web on a 100 Mbps connection, but many of the countries where ExpressVPN offers virtual servers don’t have easy access to such high-speed internet. You can find a complete list of ExpressVPN’s virtual servers here. All of the bells and whistles are great, but a VPN isn’t worth a thing if it doesn’t have top-notch security. Fortunately for us, that’s actually one of ExpressVPN’s strong suits. There are a few main areas we want to touch on. ExpressVPN is based out of the British Virgin Islands, which is a positive for privacy and security, since they’re less vulnerable to surveillance, DMCA and copyright actions, and the other nuisances found in places like the US and other “Fourteen Eyes” countries. ExpressVPN is very transparent about what they do and don’t log. While they do log a minimal amount of non-identifying info, like the server location you chose, how much data you transferred, and the dates that you connected, they don’t log the important stuff, like your browsing activity, your IP, or the exact time and duration that you connected. And while many VPNs talk a big game about their logging policies, several have been exposed in the past when they failed to live up to their promises. ExpressVPN, on the other hand, has proven their claims. When their server was seized by Turkish authorities in 2017, they didn’t turn over user data – because they had none to turn over. A non-logging VPN is crucial to your privacy and security, and ExpressVPN has shown themselves to be one. If your VPN connection drops while you’re using it, even for a split second, that could be enough to expose your personal data or activity. That’s why it’s so important to have a VPN with a killswitch. The moment your connection fails, ExpressVPN will instantly stop all internet traffic, protecting your data from leaking in the process. And the killswitch works on both desktop and mobile. ExpressVPN uses military-grade, 256-bit AES encryption to keep your data safe. It also uses the OpenVPN protocol by default, but they also give you the option to use other protocols, like L2Tp/Ipsec, or PPTP. Most users don’t need to mess with this, but more advanced users will appreciate the choice. Split tunneling is a handy feature that lets you send some of your internet traffic through a VPN tunnel, while the rest of your traffic is sent normally. The great thing about split tunneling is that allows you to maximize your internet speed for non-sensitive activity and also obscure your VPN use. For instance, you could send your torrenting traffic through your VPN, while you watch Youtube through your normal connection. ExpressVPN gives you total control over which apps you do or don’t route through the VPN, and it’s really easy to set up. ExpressVPN uses its own private DNS on all of its servers, which protects you from DNS leaks. Their app also protects you from IPv6 and WebRTC leaks. And what’s really neat is they even included built-in tests for all of these leaks, so you can make sure they’re working at any time. ExpressVPN’s commitment privacy extends to their funding of privacy advocacy groups, like the Electronic Frontier Foundation (EFF) and Internet Defense League. Another positive for ExpressVPN is their 24/7 support. 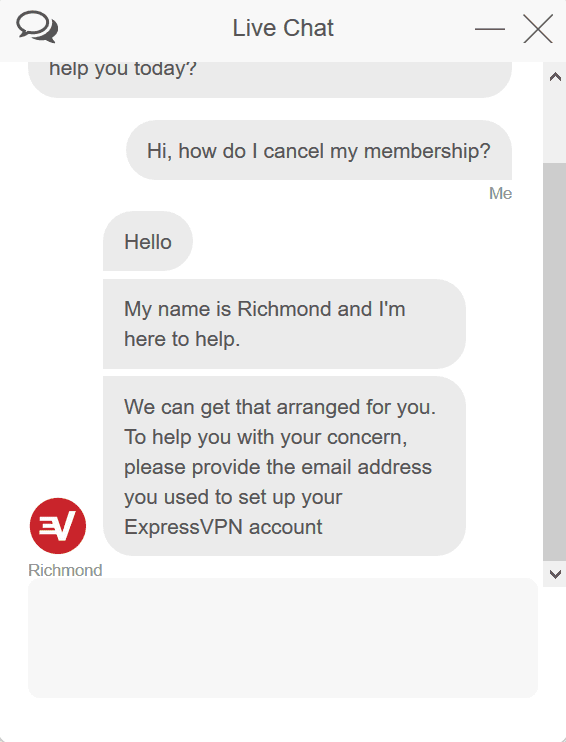 Unlike some VPN providers who force you to rely on a ticket system, ExpressVPN has a live chat feature that’s super easy to use and gets your questions answered in a hurry. We didn’t need much support during our time using the VPN, but we did ask a couple questions just to test it out – and we got a response within seconds. That’s always a plus. Okay, so now that we’ve covered every aspect of ExpressVPN’s service, let’s recap. We loved ExpressVPN’s security, speeds, server selection, app functionality, and customer support. It’s also Netflix and torrent friendly, which is a must. On the other hand, it is a little pricey. And each account only allows 3 simultaneous connections, which is less than the competition. So, the question is, is ExpressVPN worth it? Our answer is a resounding ‘yes’. In the end, you are paying a premium price, but you’re getting a premium VPN. And their 30-day guarantee means you can buy with confidence.